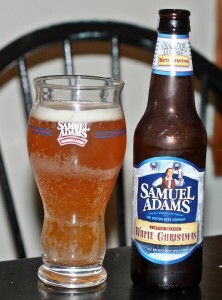 If you go back to the early days of my blog you will see a lot of Sam Adams beer reviews. It was easy to by a variety 12 pack and get some inexpensive and decent craft beer to review. These days I rarely buy Sam Adams beer but I will grab an extra from my brother in law on occasion to review here. 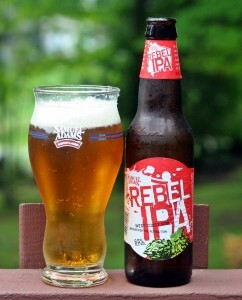 Rebel IPA is their west coast style IPA which uses Cascade, Chinook, Centennial and Amarillo hops. 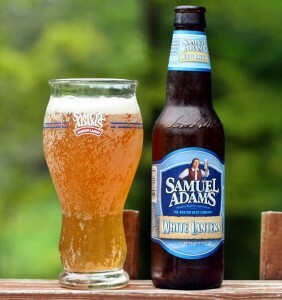 Appearance is typical of a Sam Adams beer, crystal clear pale orange with a nice white head. Aroma was mild but pleasant with some pine and citrus hops present. Taste was better than the nose with more fresh hops than I expected; citrus and pine dominate. Finish is clean making for a very enjoyable beer. Don’t be afraid to buy an IPA from Samuel Adams as this is actually quite tasty. Brewers Description: Introducing Rebel IPA, the first West Coast style IPA from the same brewers that started a craft beer revolution in 1984. 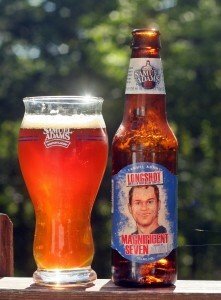 The third and final beer from the Samuel Adams LongShot Homebrew Competition six pack. Like the Strawberry Lager this is a nice looking beer with a nice orange color and perfect two finger white head. Once you get beyond the appearance there is nothing else exciting about this beer. Aroma has some bread but not much else. Taste is blah with almost nothing happening, not sure what the hibiscus was supposed to add but I wasn’t getting much. This beer was not necessarily bad but just completely blah with no discerning flavor. There were 2 in the 6-pack and I cannot think of a reason to open the second one. 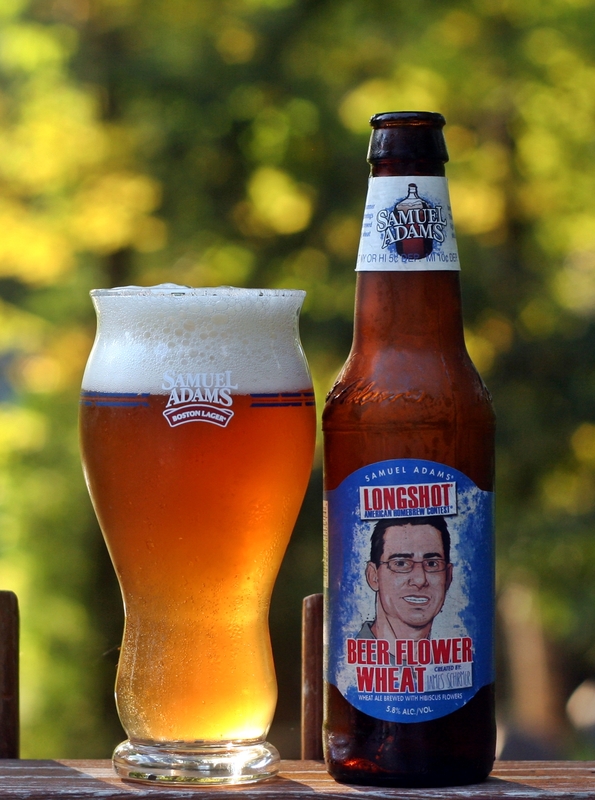 Brewers Description: With the hot summer months and fun gatherings in mind, James brewed an easy drinking wheat beer with an exotic kick. This beer is smooth and light with the delicate flavors of hibiscus. I met Zack Adams the winner of the 2012 LongShot competition at Hill Farmstead’s Festival of Farmhouse Ales in August. I was aware of the competition and the fact the winners had their beer brewed by Samuel Adams and put into 6-packs but I had never sought one out to try. After meeting Zack I figured I would track it down and found one at Roopers in Auburn. Unfortunately the 6-pack was 3+ months old when I bought it so it was far from fresh. Being a double IPA this one really should have been enjoyed fresh and I am sure the combination of Samuel Adams scale and the lack of freshness caused this beer to lose something. The color is a bit darker than a lot of other double IPAs and the aroma was probably past its prime as it had some remnants of a solid hop bill but more malt than anything. Taste was OK and I am sure the fresh homebrew by Zack was considerably better than this 3+ month old bottle. Overall not a bad beer, next year I will try to find my LongShot 6-pack in May when it is released. Brewers Description: Zack and his friend Pat decided to create a brew loaded with their seven favorite hops. A showcase of US hop varieties and true to an Imperial American IPA, this beer has a big grapefruit, pine & resinous notes. I heard about this beer last year but never grabbed one. For those that have not heard about it Porch Rocker is a Radler/Shandy style beer, basically a blend of beer and lemonade which sounds odd but refreshing. Last week I was in my local convenience store and grabbed a single. I opened it on a very hot Saturday afternoon hoping it would hit the spot. Beer pours a crystal clear pale yellow color with minimal white head and no lacing on the glass. Aroma is all lemon which was quite nice on a hot summer day. Taste was OK but very sweet, lots of lemonade flavor initially followed by a bit of beer. Overall this was not a bad beer and was refreshing on a hot day but not something I would buy on a regular basis. 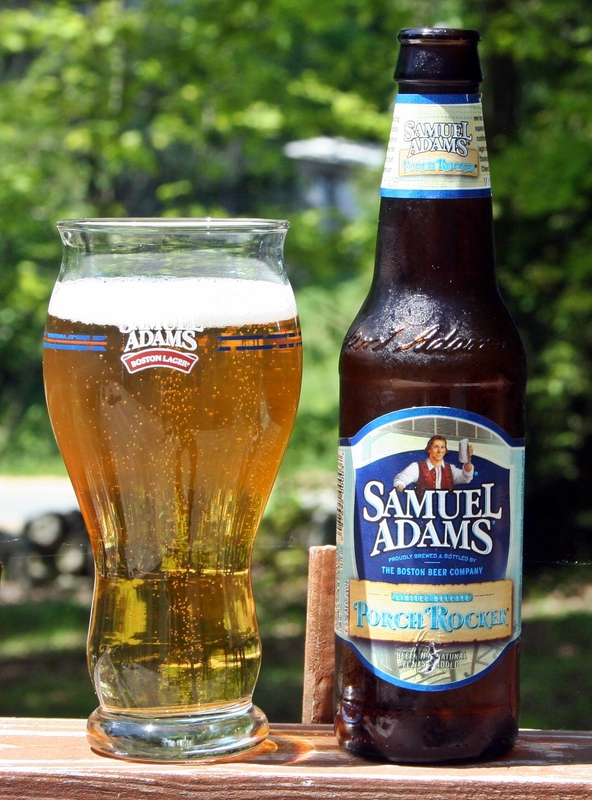 Brewers Description: Perfect for any summer day, Samuel Adams® Porch Rocker™ is bright and citrusy with a fresh-squeezed lemon effervescence and a refreshing finish. Crisp & tangy, with its combination of lager & tart lemonade this unique summer quencher is our take on the Bavarian Radler, named for cyclists that originated this drink. This beer was originally produced in 1976 by Jack McAuliffe at New Albion Brewing Company and many consider this to be the beer that started craft brewing. Last year Samuel Adams decided to pay tribute to this beer by producing and distributing it using the original recipe and packaging. I decided to buy a 6-pack and wish I hadn’t. The beer is classified as an American Pale Ale but using today’s standards falls flat when compared to today’s hoppy, colorful pales. There really is nothing to exciting about this beer from the appearance, aroma, taste, etc are all very blah. It is interesting to see how beer from 1976 compares to today’s craft beer but that is really the only reason to drink this beer. If you go all the way back to when I started my blog you will see an excess of Samuel Adams reviews as it really was the gateway brewery for me as it is for many people. Sam Adams makes such a variety of styles it is a good place to start as you can learn the styles and flavors. Nowadays I don’t drink a lot of Sam Adams unless I am at a chain restaurant and all they have is Boston Lager or their seasonal on tap. Overall I still consider Boston Lager to be one of the best lagers available and I usually enjoy Samuel Adams beer. This beer is part of their Winter Variety pack and I stole one from my brother in law so I could review it here. The beer pours a hazy gold color with thin white head. Pretty blah appearance especially in my not so clean Sam Adams perfect pint glass (look at all those bubbles sticking to the side). Aroma is sweet with some spices coming through, between the appearance and the aroma I am not getting too excited about this beer. Taste has the spices I expected with some citrus zest but everything seems to be off. Flavors are working against each other instead of complimenting one another. I got half way through the glass and then poured it to move on to bigger and better beers. Brewers Description: As crisp as the first snowfall of the year, this unfiltered white ale is blended with holiday spices including cinnamon, nutmeg, and orange peel. The familiar citrus and wheat characters of the ale are complemented by the warmth of the spices for a festive brew that’s perfect for the season. This is another IPA that was part of Samuel Adams Hop-ology. So far I am not too impressed. Grumpy Monk is the Belgian IPA included in the variety pack. Appearance is OK, nice orange color with thin white head. Minimal lacing left on the glass not a very impressive start. Same goes for the aroma which is minimal with some light malt and a bit of banana, citrus hop. Have to get your nose almost in the beer before picking up anything so again not too impressed with this. Taste is a little better as you get a fair amount of malt flavor but minimal hops which is why most people buy IPAs. Beer goes down easy and with a relatively low 5.7% ABV and 188 calories it is certainly drinkable just not something I would seek out. Brewers Description: The long held brewing traditions of Belgian monks aren’t meant to be broken. Yet, to the monks’ dismay, the distinctive character of Belgian yeast with its spicy clove and fruit notes can be reimagined when combined with the brazen hop character of an IPA. These hops impart a citrusy, piney, and earthy flavor that’s balanced by a roasted malt sweetness for a complex and playful brew. I picked up the Samuel Adams IPA variety pack which has six different styles of IPA in it. Two of the styles I had previously reviewed and this was the first of the other four. I’m really hoping the other three are an improvement over the Third Voyage. This is the Double IPA and if you have been following my blog you know I love double IPAs so I was really looking forward to this one. Unfortunately it did not impress. Color is typical of a double IPA dark orange to red with a nice white head. 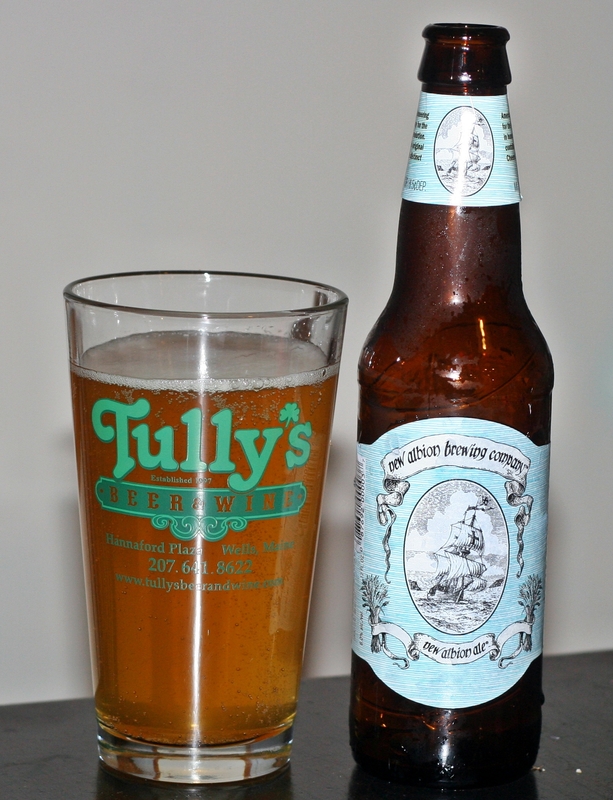 Smell had some hops but was mostly sweet malts – not your typical floral, fruit, pine hop aroma. Taste had some hops up front but was quickly overpowered by the sweet caramel and alcohol taste. I’m not sure what this one was missing but it seems like the hops were competing instead of complementing each other. Not their best effort, especially in a category that has so many great beers. Brewers Description: Bright and intense with a vivid hop punch. Third Voyage features Cascade hops from different growing regions throught the world. The unique conditions of soil, moisture, and sunlight from each yield subtle differences that make this beer a complex medeley of hop notes. For our double IPA we used Cascade hops from each of these regions to give the beer a distinct grapefruit and piney hop character. We add a touch of sweetness with Caramalt and honey malt for subtle hints of caramel and toffee. The result is a brew that’s citrusy, earthy, and full of bold character.